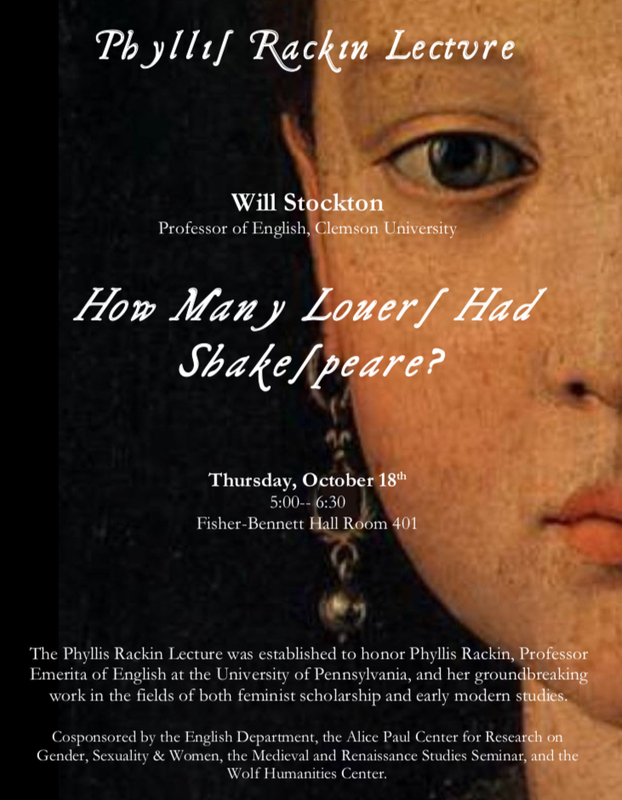 Will Stockton, Professor of English at Clemson University, will give this year's annual Phyllis Rackin Lecture, "How Many Lovers Had Shakespeare?" The Phyllis Rackin Lecture was established to honor Phyllis Rackin, Professor Emerita of English at the University of Pennsylvania, and her groundbreaking work in the fields of both feminist scholarship and early modern studies. Reception to follow. Cosponsored by the Med/Ren Seminar, the English Department, the Alice Paul Center for Research on Gender, Sexuality & Women, the Medieval and Renaissance Studies Seminar, and the Wolf Humanities Center. Contact Alicia Meyer with questions (aliciame@sas.upenn.edu).